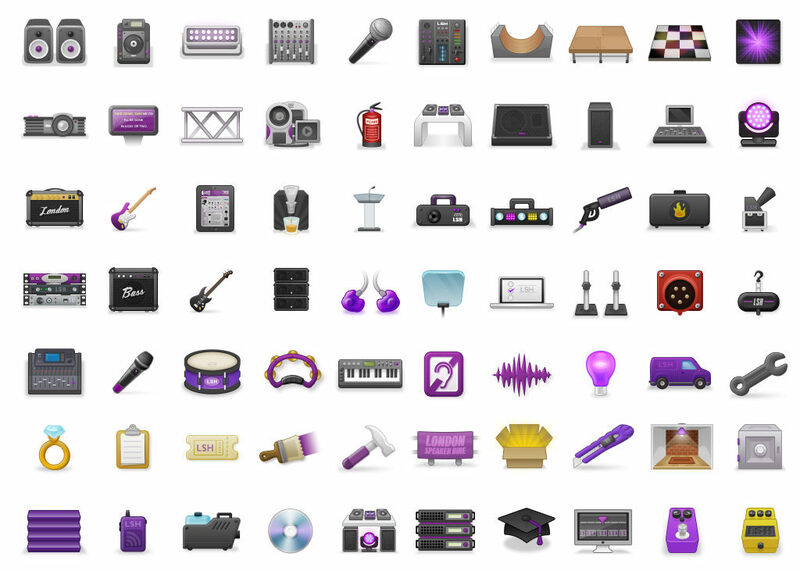 LSH Icon set – London Speaker Hire deal with a huge amount of audio and visual equipment. For website categorisation, a large set of icons were created from wireless microphones to laser lights to dance floors, and everything in between. Form: Form is the underlying structure of an icon, or how it is made. If you ignore the details of an icon and draw a line around the major shapes, do they form a square, a circle, a horizontal or vertical rectangle, a triangle or a more organic shape? The primary geometric shapes — circle, square and triangle — create a visually stable foundation for icon design. Aesthetics Unity: The elements that are shared within a single icon and across an icon set are called the aesthetic unity. These elements are things like rounded or square corners, the specific size of corners, limited and consistent line weights , the style, the colour palette and more. The aesthetic unity of a set is the collection of design elements and/or choices you repeat throughout the set to visually tie it together as a cohesive whole. Recognisability: Recognisability is a product of an icon’s essence or what makes an icon unique. Whether an icon works ultimately depends on how easily the viewer comprehends the object, idea or action it depicts. Get Involved and Share the LSH Icon set!